Melt the butter in a large frying pan over medium heat. Add the onion and garlic and cook, stirring occasionally, for 25 minutes or until softened. Add the tomato paste and flour and cook, stirring, for 2 minutes. Add the vinegar and cook for a further 30 seconds. Add the Worcestershire sauce and stock bring to the boil. Reduce heat to medium and cook for 15 minutes or until reduced and thickened slightly. Sprinkle with salt and pepper and stir through the thyme sprigs+. Allow to cool completely before freezing. Makes 3 cups (750ml). + Adding the thyme at the end of the cooking process ensures a fresh burst of flavour once the gravy is defrosted and reheated. 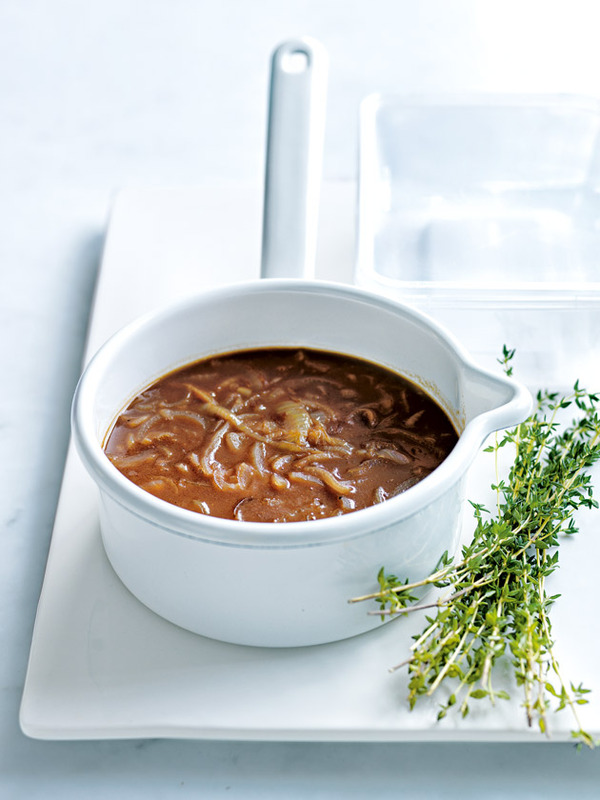 Tip: To freeze, pour the gravy into 3 x 1 cup (250ml) containers and freeze for up to 3 months. To defrost: Simply remove the gravy from the freezer and heat in a small saucepan over low heat until defrosted and warmed through.